When President Obama headlined his 194th fundraiser for the Obama Victory Fund on Friday, he had already held more fundraisers for his reelection campaign committee and the Democratic National Committee in his third and fourth years in office than his past four predecessors in the Oval Office combined. 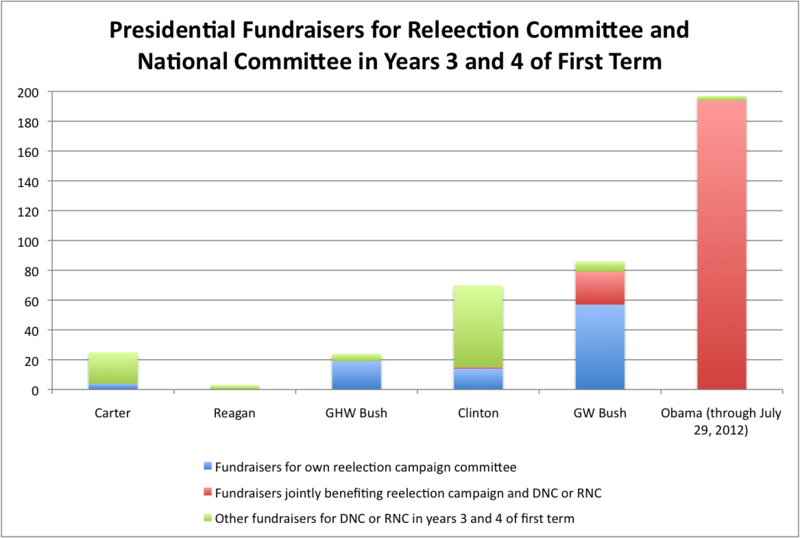 But while much media attention has focused on Obama’s record breaking reelection fundraising, less consideration has been given to why we see these important dynamics and how they fit into a longer and bipartisan trend of escalating amounts of time devoted to fundraising. While it’s understandable to focus on President Obama’s fundraising, it is important to note that Bill Clinton broke George H.W. Bush’s reelection fundraising record, George W. Bush eclipsed Clinton’s totals, and now Obama has left Bush’s pace far behind. Why? I argue that these dynamics are an unintended consequence of our campaign finance system. The rising costs of campaigns combined with contribution limits that are low relative to the costs of campaigns have led presidents to spend more and more time raising money out of political necessity. When presidents must raise money in increments in the low thousands to finance campaign costs that are now in the hundreds of millions, they must devote more and more time to doing so, and they start their reelection fundraising earlier and earlier in their term. These dynamics have been exacerbated now that public funding, which long held down the amount of money raised and spent by presidential campaigns by offering campaign funds in exchange for voluntary spending limits, no longer offers sufficient financial incentives to run a winning campaign. The specter of Super PACs raising money in increments in the millions only puts more pressure on President Obama to spend more time raising money in the relatively small increments prescribed by campaign finance law. Ironically, legislation that aimed to reduce the role of money in our electoral system has led to presidents devoting more and more of their precious time to fundraising. Brendan Doherty is a political scientist at the U.S. Naval Academy.